VAIO will be a feature baked into the next major version of vSphere and is, to me, much more important in the grand scheme of things than any sort of configuration maximum value. In today’s ecosystem, it’s quite difficult to insert additional value into the IO path of a VM. Commonly, vendors get around this by using virtual appliances and protocol tricks. This adds overhead and complexity that will ultimately be reduced or eliminated by VAIO. Interestingly enough, VMware selected SanDisk to be a partner for the journey to create the VAIO design. This is the same company that acquired both FlashSoft and Fusion-IO – that’s a lot of brain power along with software and hardware knowledge to tap into, so it makes a lot of sense. To wrap my head around it, I had a few conversations with Serge Shats, Engineering Fellow at SanDisk, to discuss the implications of this development. In my own words, I compared it to building a new highway – the APIs – so that everyone in the ecosystem can then bring their car design to market and see what works. I’ve already shared that VAIO will leverage filters in the VM user space (user world) rather than the kernel itself. This means that – as one would expect – each VM can be treated as a granular object and handled accordingly. It also means that the first set of use cases that VMware is interested in exploring revolve around distributed, cache-coherent, write-back acceleration along with replication (such as EMC and their RecoverPoint software). When new layers of cache are inserted into the IO flow of a VM, old performance problems are solved and new dirty data problems are created. Let’s take a deeper dive by looking at a slide that SanDisk used in their Tech Field Day presentation. VAIO holds open the VMDK lock, thus HA is prevented from starting up the VM. VAIO can then flush the data before the lock is removed and the VM is powered on. Again, I’m just spitballing here, but being able to query an API that understands the VM state is critical. Lots of new options will be available beyond just caching and replication once everyone at VMware and the vendor ecosystem get the warm and fuzzies on VAIO. Although I think VAIF makes a cooler acronym (wink), the technology behind VAIO is spectacular and, quite frankly, very overdue. 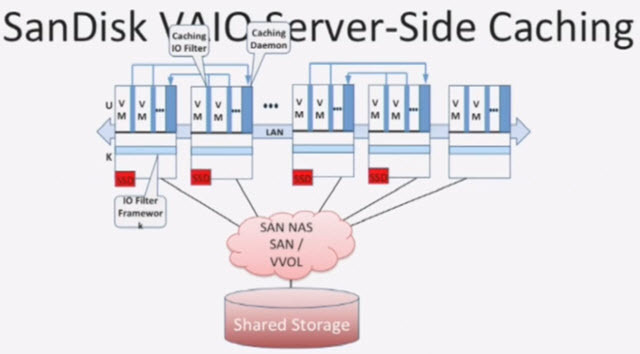 The vFlash Read Cache (vFRC) fiasco really shined a light on how not to implement server-side flash caching in a number of ways: it was read only, it was manual, and it was clunky. VMware’s new focus is on an open set of APIs for the ecosystem, which is a much better plan of attack to strategically let the vendor space focus on doing what they do best – creating great user experiences on top of the vSphere platform. Looking forward to VAIO in vSphere.next, along with FlashSoft’s latest product release that will take advantage of it.